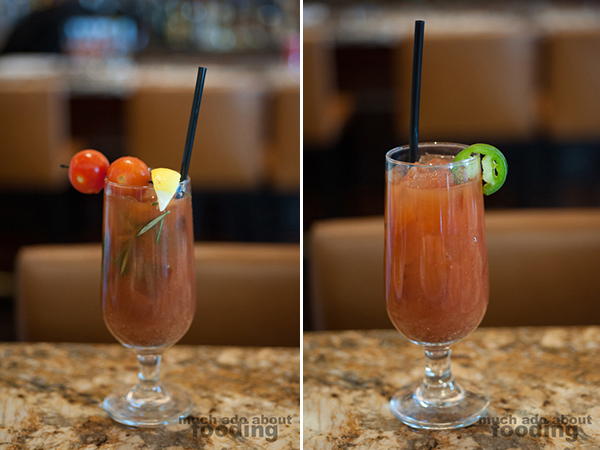 When I was doing research on brunch and all of its components a few months ago, I came across markedly different stories about the origins of the Bloody Mary cocktail. The creator title is attributed to more than one person and place but with such interesting back stories that I'll take any claim to fame with a rim of salt. One of those origin stories places the Bloody Mary's creation at the St. Regis Resort's location in New York where that iconic drink was called a Red Snapper. To celebrate the 80th anniversary of the signature cocktail's birth, St. Regis Monarch Beach in Southern California is offering a Bloody Mary bar for 80 days (Memorial Day to Labor Day) which will give guests the ability to invent their own version of the hair of the dog drink. If you aren't interested in making up a concoction of your own without proven success, you can also get any one of their variations from any of their worldwide locations - they're all different! We got a chance to sip on several of these unique ones, and they were all markedly diverse though based on the same mix. Check out what some of the concoctions are! In general, the base of the cocktails are based on the original recipe created by Fernand Petiot in 1934. Spicy and savory, the Bloody Mary has become a staple at brunch in restaurants all over and some even use it as their own "hangover" cure. The very basic breakdown of one involves a spirit and tomato juice with a kick of spiciness. The various St. Regis locations have taken it upon themselves to switch around those elements and make community-specific versions such as the location in China which uses Tsingtao beer instead of vodka (the 'Great Wall'). You can take a look at some of the ones I got to try below to get some inspiration if you partake in the bar which will allow you your choice of vodka, mixer, and garnish. Mixer choices: classic recipe, extra horseradish, chiles and peppers, and chipotle habanero. Garnish choices: salted rim, unsalted rim, and a variety of pickled vegetables. To start, we had the Red Snapper (St. Regis, New York - the "original" made of Ketel One vodka, tomato juice, Worchestershire sauce, horseradish, and lime) which was a basic Bloody Mary, definitive of what the cocktail should be. I found this one mild and barely spicy. It's certainly a good starter for someone wanting to see what the base taste should be like. 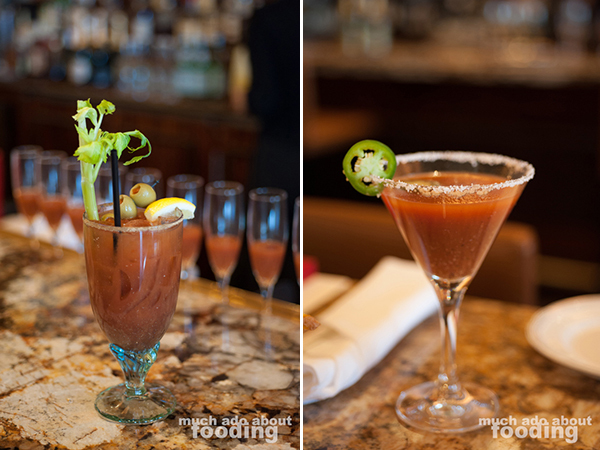 We tasted these at the Monarch Beach property so the next up was their version: the Agave Maria (St. Regis, Monarch Beach - Herradura Silver tequila and green jalapeno with St. Regis Bloody Mary mix). It made sense to give a bit of a Mexican flair to this one considering the location in southern California. We have plenty of those culinary influences in our cuisine anyway. This one was significantly spicier than the previous but not unbearably so. The tequila paved a smoother path with each sip, and the salted rim was a nice touch. 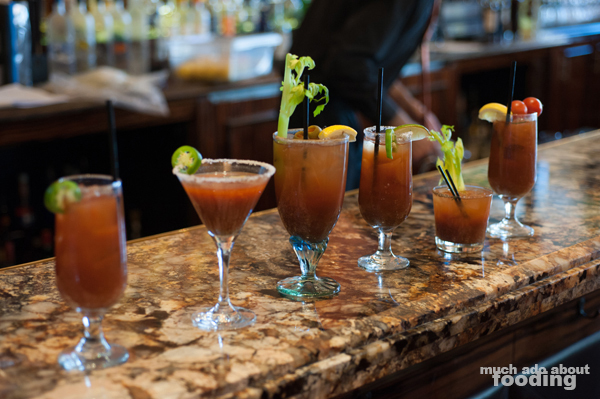 We moved next to the Aloha Mary (St. Regis, Princeville - organic vodka, Sriracha, wasabi powder, and clamato juice), a Bloody Mary that hit you hard with spiciness. With both wasabi and Sriracha, I guarantee that your sinuses will feel clearer after a sip of this. Plenty of people around the table actually found this one to be their favorite because of the pleasantly fiesty kick. As for the next one, though I appreciated it, it did not necessarily sit well with everyone and for good reason. The Bloody Smoke (St. Regis Lanesborough, London - 10 year Laphroig whiskey and cracked black pepper) lives up to its name. Smokey and sultry, this Bloody Mary barely seems to possess the typical flavor profiles of the cocktail but rather has a personality of its own. You really would have to like smokiness in your drink for this one; its lowball glassware seems appropriate for its strong whiskey shine. My favorite ended up being the Mardaval Pepper Snapper (St. Regis, Mallorca - Hendrick's gin, cherry tomato, rosemary, and Mediterranean-infused Bloody Mary mix) which was not a big surprise once I learned what was in it. I must be a gin girl through and through! The herbaceous notes in this one felt perfect for some sipping in a luscious garden. The large sprigs of rosemary made no effort to be hidden, and the juniper shone through in the gin. I liked how this cocktail made no fuss to conceal just how green it tasted though maybe a wee bit more prominence in spiciness would have been better. The last of the row (don't worry - we had small taster versions and not the full-size as pictured!) 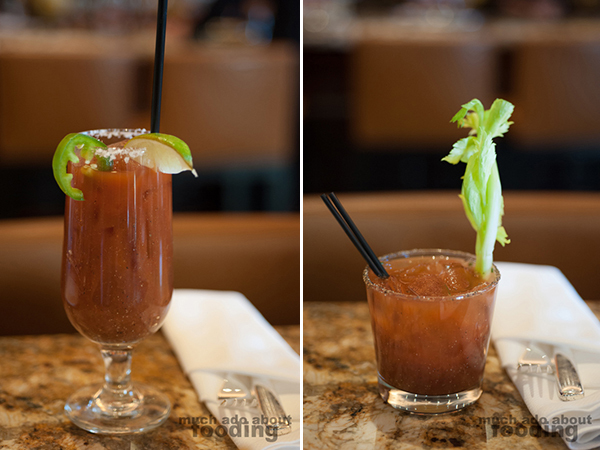 was their Texas Bloody Mary (St. Regis, Houston - equal parts Ketel One vodka and Herradura Silver tequila with lemon and lime juices), an interesting blend and variation on the Red Snapper. To be honest, I don't remember much about this variation other than it definitely had more pizzazz than our inaugural sip that day. Whereas the Red Snapper was almost flat, this Texan cousin carried a small pocketful of "yee-haw" with its tequila shot. Of course, how do you enjoy all of the tasty cocktails without some food as buffer? Executive Chef Raj Dixit had goodies from their Lounge menu which guests can get a taste of as well. 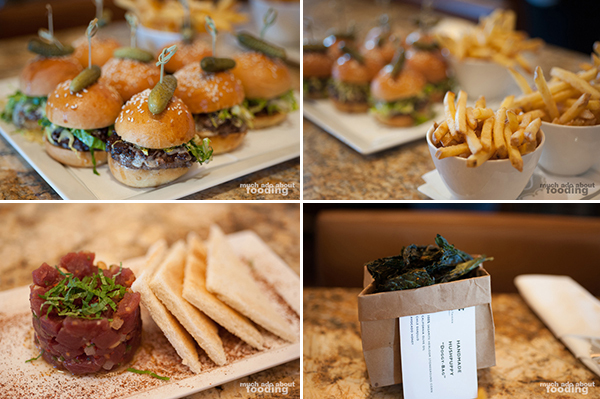 We tasted a sumptuous array of American Kobe Sliders, Truffle Fries, Ahi Tuna Tartare, Crispy Kale Chips, Cocktail Shrimp, and a Caesar Salad. The truffle fries and kale chips were exceptionally addictive, and the Caesar salad was strong on the anchovy so make sure you like that flavor if you get it. 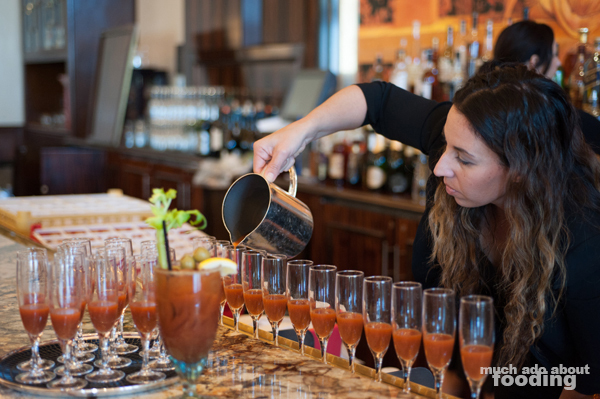 The St. Regis Monarch Beach's 80th anniversary celebration with the Bloody Mary bar and offerings of Bloody Marys from all of their locations begins on Memorial Day 2014 and continues through to Labor Day. 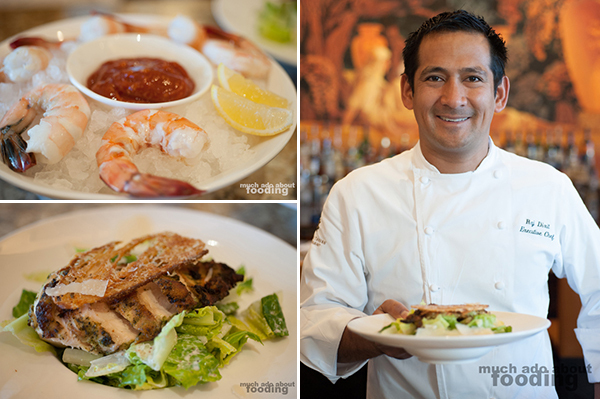 Visit them at 1 Monarch Beach Resort N, Dana Point, CA 92629, and I hope you enjoy. If you get a chance, let me know what your favorite one is. I might just have to get back to have a full version of that Mardaval!